Today proved to be a long day. They no longer feel that her bowel is twisted but that she has extreme constipation as a result of her one chemo med, nauseau, vomiting and also this hot weather. I understand this to be a real struggle with chemo patients. Today she had a NG tube inserted(goes up her nose and down back of throat into stomach). She will receive her meds this way, as well as TPN feeds once she comes home. Cheyenne has lost about 4 lbs in the past 10 days, and because she has no desire to eat this will help to boost her caloric intake. Before she can come home she must be having bowel movements and tolerating food. At this point they feel it will probably be a few days, but things are always prone to change. Cheyenne is not herself at all, no smiles, no chatter. This was the most of a grin I got all day. 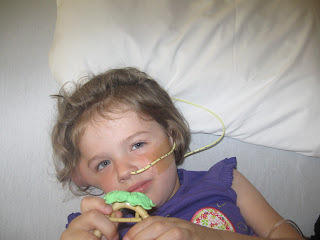 She is holding a little toy she got from the nurse for being 'co-operative' while getting her NG tube placed. We are praying for you all. May you find peace thru this trying time.